When I first saw this recipe for Chinese bacon in Fuchsia Dunlop’s Land of Plenty: A Treasury of Authentic Sichuan Cooking, I knew I had to make it. I am fascinated by charcuterie that is outside the Western tradition. Most of us who do charcuterie stick to Italian or French or German traditions, and, less often, Spanish, Eastern European or, maybe, Middle Eastern cured meats. 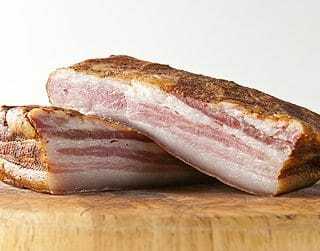 China is a world unto itself, and, as Dunlop says, there are scores of bacon styles in that pork-loving country, each with its own mixture of spices and aromatic woods. This recipe is a riff off hers, although my method is considerably different. 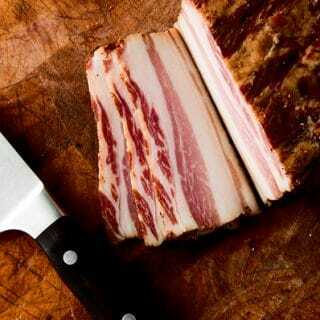 You will need nitrite for this recipe, which you can buy online or in some good butcher shops. 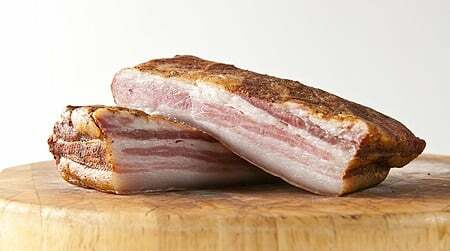 If you don’t use nitrites here, you will need to smoke the bacon at a much higher temperature, closer to 225°F than the 140°F I do. (If you are scared of nitrites, please do yourself a favor and read this excellent essay on meat curing safety by my friend Michael Ruhlman.) You will also need Sichuan peppercorns and Shaoxing wine to make this bacon, although a dry sherry is a fine substitute for the Chinese wine. You really, really need to smoke this bacon. It’s OK unsmoked, but it takes on something magical when those Asian spices — cinnamon, cloves, star anise — mingle with wood smoke. You can smoke the pork as long or as little as you want, but please do your best to put this puppy in some sort of smoker. You can usually get big slabs of pork belly from local pork producers at your farmer's markets, or any decent butcher can order you one. You do need some curing salt No. 1 for this recipe, which you can buy online. Once made, this will keep about 2 weeks in the fridge, and indefinitely in the freezer. Moisten the pork belly with the Shaoxing wine. Mix the rest of the ingredients together and rub into the meat, making sure all surfaces are coated. Put the pork into a large sealable plastic bag, or vacuum seal bag, or just a plastic or glass container just about large enough to contain it. Sprinkle over any remaining cure, seal the container up and put in the fridge. Every day for 5 days, turn the bacon over. After 5 days, check to see if the bacon is firm. If it is not firm throughout, give it up to another 2 days in the fridge. Take the bacon out, rinse off the cure and pat it dry. Set the bacon out on a rack to dry, preferably in a cool, airy place. Let it sit for 1-3 hours. Smoke the bacon over the wood of your choice. I try to keep the smoker as cool as possible because you don't want to fully cook this bacon; less than 200 degrees Fahrenheit is ideal. It is supposed to be very smoky, so go for at least 4 hours. Remove it from the smoker when it's as smoky as you like, then let it cool to room temperature before putting it in the fridge or freezing it. Browse through all kinds of different recipes for bacon and other smoked and dried meats, here on Hunter Angler Gardener Cook. For what it is worth, if my bacon is a bit salty I will soak it in cold water for 20 minutes or so then test another piece. This reduces the saltiness for me.